You are currently browsing the Bobulate blog archives for June, 2010. The old adage "if it ain’t broke, don’t fix it" applies, but nonetheless I felt the need to fix my laptop. It was cluttered with FSFE materials that I shouldn’t be carrying around, for one thing, and the Kubuntu 9.04 on it was decidedly long in the tooth. As prepwork for Akademy (o harbinger of doom!) I decided to clean it up: one Linux install, one OpenSolaris. This is an MSI 620GX laptop, which is a Centrino 2 based machine. Hardly exotic stuff. For social reasons — as in, Sebas had recently written glowingly about it — I started off with OpenSUSE 11.2. Installs nicely (but with GPT by default, it seems?) and delivers a good-looking KDE4 desktop, plenty of apps. Compositing was enabled (GeForce9600M GT). Setting up a devel environment was a mild challenge. For various projects I use svn, git, mercurial and darcs, so getting those is a first priority. Darcs was a little harder to get, but there is a package available, which I downloaded and installed manually. It was in one of the repositories, but I didn’t feel like setting that up for one package. It’s when I tried to suspend to RAM or to disk that issues started showing up. Suspend to RAM fails, saying that the machine is unknown and not whitelisted. s2ram -f puts the machine to sleep, but it doesn’t resume. Similarly, hibernate (suspend to disk) works but doesn’t resume. I still need to send in the info for that, but after a half hour of fiddling with it — and knowing that Kubuntu 9.04 could suspend and resume on the same laptop, I gave up. Since I’m not particularly attached to whatever Linux I’m using, time to try something else. Kubuntu 10.04 is what I’m running on my desktop — which has ATI graphics — and I appreciate that it starts up really quickly, etc. Vaguely annoyed at the microblogging thing it puts on the desktop by default, but that’s terribly minor. Installing all the dev tools was easy on the desktop. On the laptop, though, I didn’t even get that far. The nouveau driver included on the install CD doesn’t like the video card — and so the installation process bails out to a text screen. Folks in #kubuntu were helpful and ready with some suggestions, like nomodeset and using the vesa driver (hung the machine on boot). Running X -configure from the text login hung the machine too. Fedora 13 up next. No compositing with the nouveau that is included — that’s in the mesa-experimental package, it turns out. Devel environment is easy to get, with all the version control systems one install command away. Of course, the first thing I tried this time was suspend and hibernate: both flawless. External monitor — important for presentations at Akademy — pops up a dialog with simple configuration. There’s one third-party application that I use that requires 32-bit libraries. Getting those was straightforward after finding out the package names with "yum provides ‘*/libraryname’". I see that they’ve also customized Konversation to go to multiple useful channels, rather that just the distro-channel. 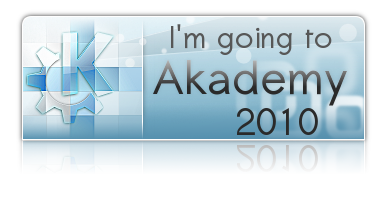 So, it seems I’ll be presenting at Akademy from a Fedora-based laptop (Rex, Kevin, a beer is on me). All I need now is the latest Air-themed LaTeX templates and I’m good to go. One thing I’m left with is why three different Linux distro’s, all relatively recent, behave so differently on a fairly conventional platform like this one. The technology is there; it was even there last year. Where do these regressions come from? Sebas wrote about Free and fast graphics a while back, which has led me to try the same on FreeBSD. I have a similar setup, with two monitors attached to a Radeon 4350. I’ve written about the 4350 on FreeBSD before. The minor challenge this time around was to get compositing working with a dual-head setup and to get the dual-head setup to show up on startup. Perhaps there’s a KDE-ish way of doing this, but I ended up setting up a xorg.conf with the desired layout. Without an xorg.conf, I’d get nicely mirrored displays, which I could manipulate sensibly with xrandr, but I couldn’t properly place the one monitor beside the other — xrandr kept complaining that my maximum screen size was 1650×1650. So, manual configuration it is. I’m using X.Org X Server 1.7.5, Release Date: 2010-02-16, built on FreeBSD 8-STABLE, amd64, using the radeon driver v.6.13.0. (I’ve left out the Identifier and BusID lines, among others — they’re not relevant; I tried the radeonhd driver, but that didn’t yield quick results). The important thing here is the explicit identification of monitor identifiers with XRandR outputs — I have a Samsung 206S monitor connected to the DVI output, for instance. From here, we go to the two monitor sections. I’ve set preferred modes on both for their native resolution. When I didn’t, I got them both at the lowest common resolution, 1280×1024, which was ugly as sin. You can see that the 206S is my preferred monitor — this sets it up as the main monitor, which means that the KDE startup thing shows up there and most notifications do as well. The other monitor — a six year old Iiyama E430 — is off to the right, and houses Konversation and Akregator and other non-essential attention-grabbers. The difference in color reproduction between the two is striking, so much so that I give the second monitor a very different background just so I notice the color difference less. The last bit is setting up the Screen for X. Here I’ve left out Identifier, Device, Default depth; the important bits seem to be the monitor and the Display, which define a primary monitor (again?) and the side of the desktop. In this case, the desktop size is the sum of the horizontal widths and the greater of the heights. Unlike Sebas, I don’t seem to have OpenGL compositing in this setup. That could be because of the card, the software — Sebas points out that it’s a little finicky with versions of kernel and video drivers — or something else. Switching to XRender gets me something that’s good enough. In the server list dialog, double-clicking a network or server connects to it; in the identities dialog it edits the identity. My comparison here is KMail, where identities and servers are both edited by double click. In the server list, when I edit a server within a network (as opposed to editing the network itself) why does the network editing dialog pop up and then the server edit dialog on top of that? Why does only the server edit dialog go away when I click OK in that case? In the network editing dialog, if I double-click a server, nothing happens. Inconsistent again. In this dialog, too, the "Add" button is text and the "Delete" button is a big red minus sign; I would expect either add and delete, or + and -. The "duplicate identity" button in the identities management dialog looks disabled, even when it isn’t, because the graphic is so grey-on-grey. Although on first startup the server selection dialog comes up so you can pick or configure an IRC connection, it’s not all that clear that you can also configure the user identity — that goes through edting a network, then clicking "edit" next to the identity selection dropdown. On the whole I think I’d prefer a tiny wizard (two steps: pick an IRC network, and pick a username and nick — possibly integrated with the addressbook so ideally you just click "next" twice to connect to the default network with the default addressbook identity). These are issues that you really only run into the first time you run Konvi — after that, you rarely see these windows anyway. From there on it’s a wonderful IRC client. Of course, since it’s in git (on git.kde.org now!) I may as well see if I can write some patches for these issues, if only as practice in using git. Sometimes what’s necessary from a business standpoint isn’t what we’d like from a Free Software perspective, but there’s no basis for real complaint. The licenses say what they say (which is why you should be careful in picking a license! ), and with a good understanding of what they actually mean, both developers and business using the fruits of that development can get on with what they do. See for instance this bit on the Freecom Music Pal (I have one of those too; it’s OK for listening to Country 105 but the author is right that it’s rather difficult to hack and the firmware is wretched). The IFOSSLR is available gratis as a PDF, or you can get a printed copy via LuLu. I’d suggest the latter, because legal journals just look really impressive on paper. As a collaborative publication, the IFOSSLR is always looking for submissions, too. See the Call for Papers for issue #4 for more information. It’s not just for lawyers — the perspective of community and developers on legal issues is really important. The practice of Free Software licensing is an interesting area because there are four (no, wait, six) parties involved: the drafter of the license, the developer using the license, the user of the software released under that license, the community (c.q. peanut gallery) of users of the license, the lawyers for each of the aforementioned parties and the courts. Getting all that to align in harmony is a big task: a task that requires communication and publication. So throw your thoughts into the fray. Now that I’ve finished a portupgrade to KDE SC 4.4.4 on my FreeBSD 8-STABLE desktop machine at home (I use FreeBSD and OpenSolaris on my desktop machines, and I’ll be switching my laptop to OpenSUSE soon) I’ve got a chance to use Blogilo,a KDE-powered offline blogging client. With the OpenSolaris packages, Blogilo crashes on startup, which I haven’t had time to hunt down yet. If this post goes through, then that means that the client software has worked, and that means that I’m satisfied with it. Which is not to say that I don’t have a barrel of quibbles with it — time to go file a bunch of bug reports, ranging from cut-off error messages to insufficient information in "details" of error messages (why couldn’t it fetch my WordPress blog ID the first time I ran it?) to a missing first-run wizard that forces you to pick a blog source first. Nested tabs. Little things which might make a satisfactory program great. The EBN server — the real one, the box in a data centre with dual power supplies and lots of other jazz — is about to be re-fitted with OpenSUSE on it. That means swapping some drives around. At least, that assumes that the machine actually supports running OpenSUSE on it. It’s a dual-cpu, dual-core, 8GB Sun X4200M2, which seems like a reasonable target to try, and what I’ll do is swap out the existing disks and swap in the disks from my home test system (which is a one-cpu, dual-core, 4GB system). However, I wanted to try out the new OS on the machine before actually bicycling all the way to the data centre at the uni. Enter, once again, Sun’s ILOM.